February 16, 2017 Michal B. The capital of the Czech Republic was always the place where the most important milestones of Bohemia’s history took place. Among other things, Czech kings used to be crowned in Prague. Coronation processions entered the Old Town through the impressive Powder Tower, a significant monument in the late Gothic architectural style. The Powder Tower, also called “Powder Gate” (“Prašná brána” in Czech), is among the most amazing and treasured sights of Prague and is considered to be one of its symbols. It marks the beginning of Celetná street, part of the “Royal Way”. This route, leading through the Prague’s historical centre and connecting the former Royal Court with Prague Castle, was a significant part of Czech kings’ coronations. Ceremonial processions took the Royal Route on their way to castle. 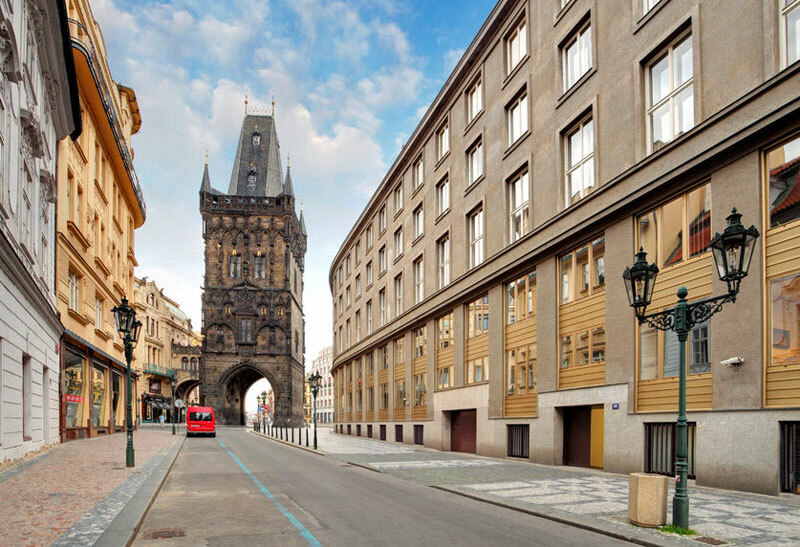 The Powder Tower is basically a gate which separates Prague’s New Town from the Old Town. 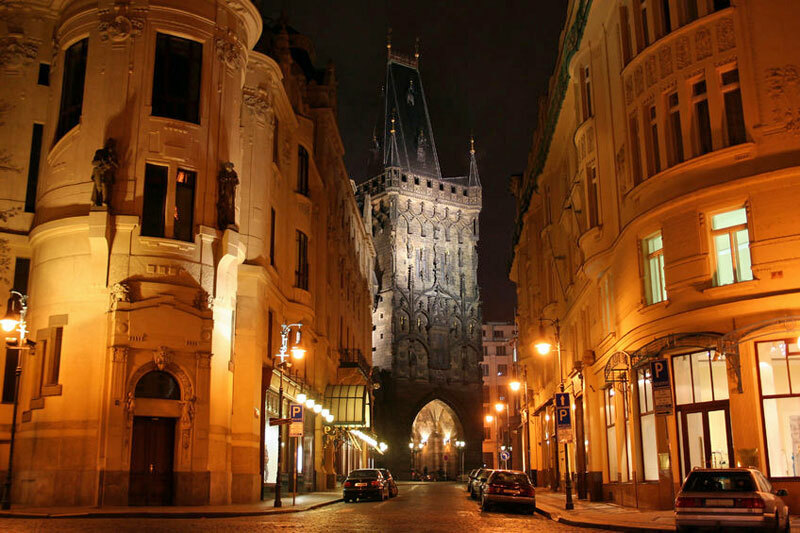 Back in the 11th century it was one of the 13 gates through which Prague’s citizens could enter the Old Town. The construction was financed by the Prague aldermen, which we are reminded of with a garish town emblem on the tower. The city thus showed proudly to be part of the ruler´s representation. At the beginning, the construction was led by Master Václav, but later on the work was entrusted to Matěj Rejsek of Prostějov, rector, teacher, and allegedly an autodidact. It was due to the fact that, at that time, there was a lack of experienced stone-cutting masters. 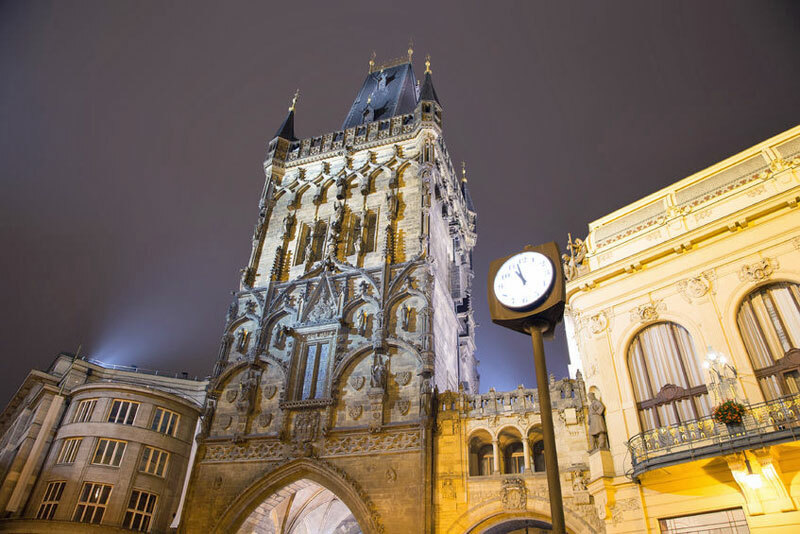 In the 17th century, the Prague Powder Tower was used for storage of gunpowder; the origin of its current name. Originally it was called the “New Tower”, probably because it was inspired by the Old Town Bridge Tower on the other side of the Old Town. The Powder Tower represents the Late Gothic style, and its design was created resembling the work of Peter Parler on Charles Bridge. The facade of the Powder Tower is decorated with statues of rulers and emblems of the lands they reigned in. The Powder Tower is 65 meters high and it takes 186 stairs to get to the top. To get to the Powder Tower you can walk either from the “Náměstí republiky” metro station or take a slightly longer walk from Wenceslas Square, along the street “Na Příkopě” which is full of stores. Inside the tower, you can, for example, watch a short film about the history of Charles Bridge and its astronomical and astrological aspects. You can also visit the viewing gallery, which is at the height of 44 meters. The Powder Tower is open daily, according to the months of the year. From November to February the opening hours are from 10 a.m. to 5 p.m., in March from 10 a.m. to 6 p.m., till 7 p.m. in April, and in May to September till 10 p.m. In October the tower closes at 7 p.m. again. The basic entrance fee is 90 CZK (the reduced fee is 65 CZK and the family fee is 250 CZK). Tickets can be purchased directly at the Powder Tower’s cash desk, which is located inside on the ground floor.